The U.S. Air Force spends about $3.6 billion a year on contractors to maintain thousands of aircraft. That amount could grow significantly as the fleet expands and planes age, increasing maintenance demands. In September, Air Force Secretary Heather Wilson announced that the Air Force was seeking to expand to 386 squadrons from 312 by fiscal 2030. Wilson didn’t specify the exact number of planes involved, but Bloomberg Government estimates that it could represent about 1200 additional aircraft. The Air Force plans will certainly face challenges in increasing the size of the fleet. One is the risk of program delays due to unforeseen events during the development phase of new planes. Another is obtaining the necessary funding from Congress. But even if the developmental and budgetary hurdles can be overcome, it will face another daunting challenge — where will it get the people to fix all the new planes? It’s not clear how many Air Force personnel would be needed if the service expands to 386 squadrons. The Air Force statement said that it would need about 40,000 more personnel to man the larger force. But Mark Cancian, a senior adviser at the Center for Strategic and International Studies, estimated that the expansion would require about additional 94,000 personnel. The Air Force is expected to produce a refined estimate of the aircraft, personnel and budgetary requirements of expansion in March, which is likely to influence its fiscal 2021 budget request, but not the fiscal 2020 request, also due in March. The Air Force is already having difficulty retaining experienced aircraft maintenance personnel. A Government Accountability Office report released this month found that in fiscal 2017, the Air Force had a 2,400-person shortage in experienced aircraft maintenance workers, out of 66,559 positions — and that the service had no strategic plan to fix the problem. Because the retention problem involves experienced personnel who can take years to train, it can’t be fixed overnight. The GAO report also noted that in fiscal 2017 the Air Force had begun contracting out some maintenance positions. Coupled with the shortage of maintainers, the demands on the Air Force are increasing. In October 2018, then-Secretary of Defense James Mattis ordered the Navy and the Air Force to increase their “mission capable” rates for front-line fighter aircraft like Lockheed Martin Corp.‘s F-35 and F-22 to 80 percent by this September. In fiscal 2017 the rate for these aircraft was about 71 percent. Making more aircraft ready for missions at any time means more maintenance. Although new aircraft are entering the inventory, some, like the venerable B-52 bomber, are still slated to fly into the 2050s, and maintenance costs for those jets will inevitably rise. Delays in fielding newer aircraft only exacerbates the problem by forcing the service to extend the lifespan of older ones. 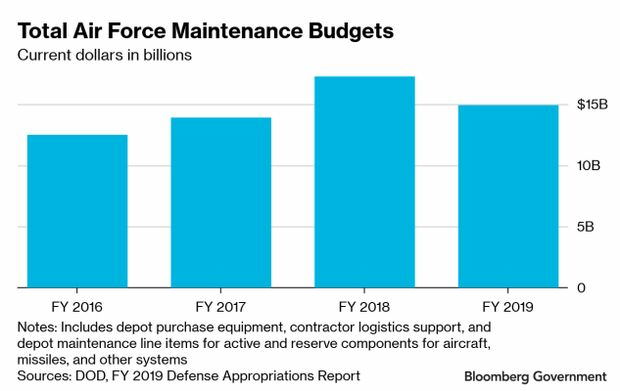 Bloomberg Government data shows that in fiscal 2018 the Air Force spent about $3.6 billion on contracted aircraft maintenance. The top contractor was Lockheed Martin, with about $1.1 billion in obligations, followed by Boeing Co., with $741 million. Some of these contracts run through fiscal 2020. Maintenance can take place at the unit level or at specialized depots and can be performed by uniformed personnel, civilians, or contractors. The Air Force budget for all maintenance — aircraft, missiles, communications gear — at both the unit or depot level has grown in recent years, peaking at $17.2 billion in fiscal 2018. Not surprisingly, spending on aircraft maintenance is about 70 percent of the total budget. The growth was an effort to dig out of a hole that dates back to the 2013 budget sequester, when the Air Force took about 33 squadrons out of the line, deferring maintenance and reducing total fleet flying hours. The Air Force knew the risks of deferring maintenance but was willing to take them in 2013. That risk tolerance began to change after Russia’s invasion of Ukraine, as reflected in the fiscal 2016 budget request. The confluence of so many factors — the proposed expansion of the Air Force fleet, the shortage of skilled aircraft maintainers, the increasing readiness demands placed upon aircraft, and the aging of its inventory — means that demands for contracted aircraft maintenance are only likely to increase. Opportunities for companies providing a range of aircraft maintenance services should see substantial market growth in the coming years.